One is the son of a rural prison officer. The other works in the slammer himself. Both brought a reminder last night that rugby league consistently delivers us stories that border on pure fantasy. 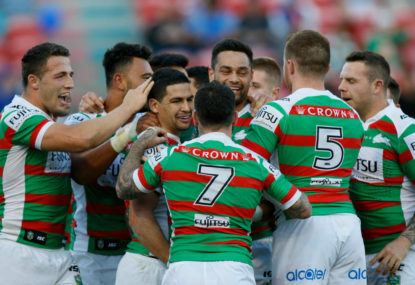 Standing on opposing sides, Cody Walker and Malakai Watene-Zelezniak played starring roles in an absorbing 21-20 win by the South Sydney Rabbitohs over the Penrith Panthers. It was a game where the parable of ‘never giving up faith’ rang loud and clear. For anyone tempted to say the NRL has become a predictable affair, you needed to be watching. Hop in a time machine and imagine a scenario 25-and-a-half years ago when Panthers debutant Watene-Zelezniak was newly born, and Rabbitohs strike weapon Walker was just one year old. For the first leg, let’s place a bet that the New Zealand-born Watene-Zelezniak, of Maori, Tongan and Polish extraction, would find his way to Australia, where he’d grow up in Western Sydney. Ok, not too far of a stretch. But now imagine he has made it past his 25th birthday, he’s already given up rugby league once before, one of his brothers has represented New Zealand and another has played for Poland. He’s so far out of consideration, the club he is playing for on a part-time basis – Penrith – doesn’t even have a photo of him in their team kit. But then the already injury-depleted Panthers elect to axe three of their outside backs for staying out too late on the booze. Watene-Zelezniak gets handed a berth, a career revival, standing right alongside one of his brothers, Dallin. Presumably he also gets the day off from patrolling the cells at work. It’s enough to make you shed a tear. And by all accounts Watene-Zelezniak did just that at least twice during the preceding days. But we’re not finished yet. Imagine wagering that on the rival team would be this bloke Walker who can, believe it or not, better that yarn. Born in Nowra, raised in Casino, rising to prominence with the Easts Tigers in Brisbane. He doesn’t debut in the NRL until he is 26, practically pensioner time. Two previous chances at the big time were thwarted at the final moment by shoulder and hamstring injuries. But when he rocks up to Penrith Stadium on this night in 2017, he will be one of the competition’s leaders in try assists and line breaks. He will turn the game completely on its head with a try before halftime, set up another try just after the break, then take a big run just seconds before teammate Adam Reynolds kicks the winning field goal. Yeah, I’m guessing you’d get pretty juicy odds for all that playing out. Either that, or you’d receive a slap across the face and get told to return to reality. If you wanted to ramp up the disbelief factor even more, you could speculate that one of Walker’s teammates would be a child actor who starred in an advert to promote the NRL eight years earlier (Alex Johnston). Or you could bet that the club they’d feature for would have been already been expelled from the competition, but readmitted after tens of thousands marched through Sydney’s streets in protest. Nah, now don’t be daft. Rugby league’s too predictable for that.